Magic Carpet Cleaning in Shepherds Bush W12 can offer amazing cleaning services for your home and office! You can join the hundreds of satisfied customers who trusted our impeccable reputation and years of experience in the field of professional cleaning. Along with the great efficiency you will also receive professionalism and competitive prices. We are concerned about your health and the future of the planet, so we use green cleaning materials. We know what it means to trust someone so we won’t betray your confidence. There are no hidden fees and charges in the free estimate. We work according to the latest techniques in our professional field. Our team has the necessary training, experience and equipment to remove even the old soil from your property. We never stop investing in our employees and make sure we offer you the best. We offer 100% reliable services and we promise to clean until you are happy with the result. You can rely on our 24/7 support team who are more than happy to help you with any questions you may have. If you want to get rid of all the dust, dirt and spots in your home or office and want to reduce the chance for allergies to minimum, then the Steam Carpet Cleaning approach is for you. This cleaning treatment is preferred by households especially if they have children or pets. With the steam cleaning, the allergens from the surface of your textile floor or upholstery are successfully destroyed. Our professional cleaners inject the cleaning solution into the rug and after that extract it by vacuum. With the hot water extraction method, we achieve 99% efficiency. We recommend dry compound cleaning for places with high human activity. These include banks, restaurants, office buildings, shopping malls and other public spaces. This method uses powdery substances that are being rubbed into the carpet and are then extracted by vacuum. This cleaning approach is very quick and does not require drying time. This means that your visitors can walk on the floor straight after it’s being treated. The lack of water protects the carpet against the formation of mold. If you want us to clean something in your home or office, no matter if it is a wall to wall carpet, a small delicate rug or upholstery, just give us a call. We can successfully handle all types of materials – both synthetic and natural and remove all types of persistent stains like coffee, traces of pet urine, wine, food, chewing gum, chocolate and others of this type. Our certified cleaning specialists achieve maximum results using products like acid, alkaloids, etc. Magic Carpet Cleaning professional cleaning company offers its services to people living or working in Shepherds Bush W12. 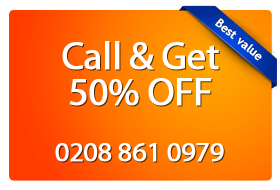 Call us on 0208 861 0979, ask your question and get your free estimation. When you are sure you can trust us, we will come and change your home or office beyond recognition.